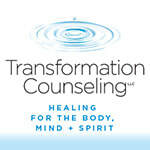 Transformation Counseling, LLC is committed to facilitating fundamental change in peoples' lives. We believe that "relief" is not enough- our purpose in this lifetime is to discover who we really are, and live our lives authentically with courage. This kind of "awareness" requires us to let go of our idea of how we think things should be, and live into the present moment with honesty, integrity, and a willingness to really see what is going on in front of us. We facilitate this deep emotional healing and growth process through non-traditional approaches to therapy, including artwork, music, guided imagery, visual journaling, dream work, movement and any other "right brain" technique that will get us to our feelings. Feelings are information that is always available to us if we are willing and ready to listen. We don’t have to “learn” anything new- everything we need to be successful in our life and in our relationships is all there within us waiting to be re-discovered and re-integrated.